Goran Filipec pertains to the group of musicians whose interpretations continue to win the hearts of international audience and critics. “…Powerful and subtle in exact degrees, with an infinite capability of phrasing and poetical deepening in the most tremendous passages, almost ignoring the infinite difficulties of the score, Filipec dedicated himself to making music…” referred Pablo Kohan from the Buenos Aires daily La Nación to his interpretation, while Edith Eisler in the New York Concert Review referred to his performance as “…brilliant and refined…”. Born in Rijeka (Croatia) in 1981, he studied piano with Naum Grubert, Natalia Trull, Oxana Yablonskaya and Evgeny Zarafiants at the Royal Conservatoire of The Hague and Moscow’s State Conservatory P. I. Tchaikovsky. Presently he is a doctoral candidate at the University Paris-Sorbonne and the Conservatoire National Supérieur de Musique et de Danse de Paris. As laureate of several international piano competitions such as Concorso Franz Liszt – Premio Mario Zanfi, Concurso de Parnassos and José Iturbi International Music Competition, he performed in Europe, United States, South America and Japan. His Carnegie Hall debut took place in 2006, followed by performances in venues such as Mariinsky Theatre, Auditorium di Milano, Minato Mirai Hall or Philharmonie de Paris, among others. 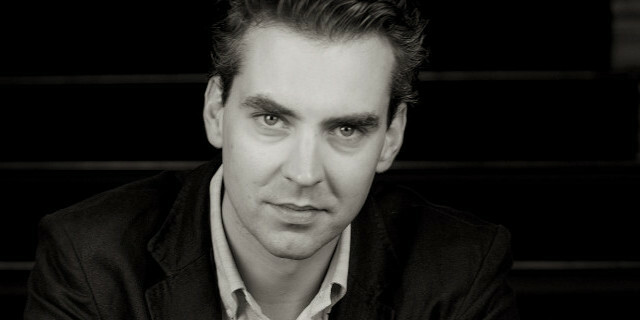 Presently, Goran Filipec is recording for Naxos label. Musician of fiery energy and well defined artistic personality, he reveals a particular leaning towards classical and romantic repertoire and music of pronounced virtuosity. There seem to be an increasing amount of young pianists these days who are willing to record Liszt’s most demanding works. I had not previously heard of Goran Filipec but it turns out this Croatian pianist has won various piano competitions in Europe and has received awards for his recordings of music by Ivo Maček from the sister label to Naxos, Grand Piano. When I first found out about this recording, I thought “great, another person is going to play the horrendously challenging Six Etudes d'execution transcendante d'apres Paganini” as I always think it is better to have more than one recording of each work. It is certainly interesting to compare it to the only other complete Paganini etudes recording, that by the incomparable Leslie Howard on Hyperion. A quick comparison of the timings for both pianists reveal that Filipec is actually faster in almost all cases than Howard. This was rather a surprise as, having studied the scores, these works really do push the pianist to their limits. The later, simpler (if this is the right word) versions have been recorded many times by many different pianists and the third of these, “La Campanella” remains a very popular showpiece. There is also a lot of confusion over which is the correct Searle (“S”) number for these – many “La Campanella” recordings claim to be S140 no.3 (the earlier harder version) and are, in actual fact, the later one! Anyway, that isn’t a problem here as we have both versions as well as various other iterations including the hybrid Liszt/Schumann version of S140 no.1 and the alternative notation for nos. 4 and 5 from S140. The disc starts with the later and less complex version of the Paganini Etudes, dating from 1851. The first of the set is mostly based on Paganini’s caprice no.6 and is basically a study in tremolos. This is a very hard piece to bring off as the tremolos have to be kept constant and not interrupted or disturbed by the tune in the right (and sometimes the left) hand. This is not a problem here and the playing around 3 minutes is very delicate and well done, as it should be, according to my score. The second of the etudes is based on Paganini’s 17th caprice and contains numerous technical problems mostly involving octaves and rapid semiquaver runs. Again, this is brilliantly played – the rapid runs are very clear and bright. As I had expected, he makes a superb job of no.3 – “La Campanella”; the playing around 2:40 is incredibly delicate – it’s worth remembering that the only FF (fortissimo) indication in the whole piece is on the final page and this is something that pianists often forget at the expense of showing off. This does not happen here. No.4 is dispatched very cleanly and rapidly – after all it is marked “vivo”. I can detect a small amount of audible pedalling here and elsewhere but it doesn’t detract from the quality of the playing. The fifth of the etudes is subtitled “La Chasse” after Paganini’s 9th caprice which it is based. Here, the first theme is supposed to be played ‘imitando il Flauto’ (like a flute) but here it doesn’t quite sound quite flute like enough to my ears. Nevertheless, this is a great performance. The sixth and final etude is the one with the theme also used by Brahms, Rachmaninov and Lutoslawski. Here all the variations are well defined with the theme being made very clear and so it is easy to pick out. Special mention is the lovely trills at about 3:40, they are ethereal sounding and very gentle. Marvellous! 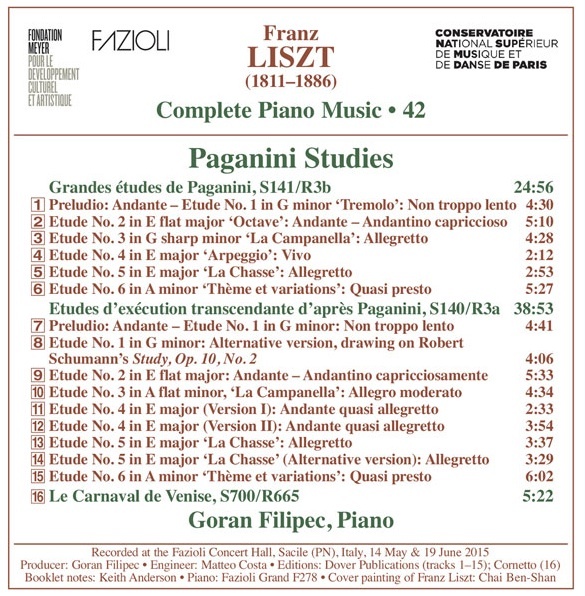 I have several complete recordings of this version of these etudes and I have to say that this is probably now my new favourite, displacing Georges-Emmanuel Lazaridis on Linn. Next follows the earlier and thornier versions of these works. The differences vary from etude to etude but in the first one, they are relatively slight being only a few additional huge stretches, big chords in the base and some additional tremolo work (especially about 3 minutes). As before, this is played extremely well and it is interesting to compare to the later version. Track 8 is another version of the first etude but this is a hybrid of Schumann’s Op.10 no.2 and the introduction from Liszt’s version making a piece which avoids the tremolos. Clara Schumann thought Liszt was mocking Robert by doing this because of the lack of notes in comparison with his (Liszt’s) version but this is not the case. Liszt was merely trying to popularise Schumann’s etude for the same reason that he transcribed so many other composers’ works: to increase their familiarity with the public at large. Nonetheless, this makes for an interesting comparison with Liszt’s solution of tremolos. The second etude in this set is vastly different to the later version in that the leaps are moved to the left hand and most of the runs are now in thirds. Not so you would notice here as all the additional complications are made to sound easy by this pianist. Then follows the horribly complex version of the 3rd etude, “La Campanella” which contains a wonderfully mad bit which comes from Paganini’s 1st Violin Concerto which has to be heard to be believed! It’s worth sitting down with the score to follow it to figure out how on earth someone is able to play music of this complexity. 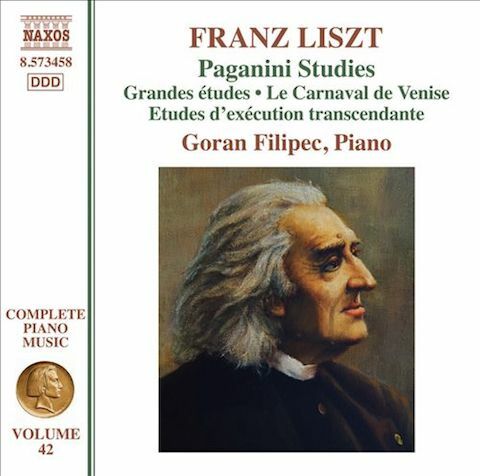 I’d hope sometime in the future someone writes a book about the links between Liszt’s various works which include the main theme from “La Campanella” as it occurs in the early “La Clochette” fantasy (S420), the two versions (according to Dr. Howard) of the Variations on a theme by Paganini (S700a and S700ii) as well as both versions of the Paganini Etudes. There is also some cross linking with the theme “Le Carnival de Venise” in some of these works! The forth etude features a whole slew of alternative texts so can be played in two ways, which is what happens here. This is infinitely more taxing than the later version (which is awkward enough!) with both hands joining in the wide leaps and jumps and mirroring each other. The alternative version includes some interesting chordal writing in the base clef not found elsewhere as well as more judicious use of chords in thirds. Both versions are brilliantly played here. A similar situation occurs with the 5th etude “La Chasse” in that there are alternative texts so the piece can be played in 2 ways. These make for a fascinating comparison so it is well worth having them one after the other to compare. The sixth and final etude in A minor subtitled “Theme and Variations” contains some striking differences to the later version, some of which are quite a surprise as personally I think the later version more closely conforms to Paganini’s original text. As a post script, the disc ends with the early Variations on “Le Carnival de Venise” (S700) dating from 1845 and published by the Cornetto edition. This starts peacefully enough before becoming more and more involved. Variation 3 (about 1 and a half minutes) is particularly interesting with the glissandi descending to the notes which make up the tune. There are some weird key changes around 3 minutes which sound really odd! This again is wonderfully played and is interesting as it is so rarely recorded. The playing throughout these very difficult pieces is top notch; I cannot fault Mr. Filipec’s virtuosity or musical feeling at any point. The playing is superb in every respect and I urge anyone interested in Liszt and Paganini to buy this very reasonably priced disc. The recorded sound is clear and bright and the cover notes, while rather short, are interesting and provide useful information about the alternative versions and iterations of these fascinating studies. I have listened to this disc many times and I have to say that Goran Filipec is a superb artist and I look forward to hearing more of his recordings in the near future. He is clearly a pianist to listen (or possibly Liszten!) out for. Goran Filipec - Teatro "El Circulo" de Rosario - "Bar Croata"
Many thanks to Yoko Nishii, Japan, for her kind information about Goran Filipec.